“What was I doing in 2008?” I thought after actually finding a penny that was minted after I was born. It took .5 seconds for me to feel ridiculous because at 25 years old 2008 happened to be one of the most important and transitional years of my life. In March my fiance and I got engaged. It was his sophomore and my freshman year and we had been together for 3 years (and will be celebrating 10 years this March). We still aren’t married mostly because we were focused on our educations and careers and partly because weddings are expensive. That summer we both spent ninety percent of our time at the baseball stadium we worked at. Our days consisted of inventory, receiving concession stand food, and cleaning. Our nights were spent running concession stands full of teenagers who were selling overpriced popcorn and soda. We made a lot of money and we had a lot of fun. It was out last season working for the Sea Dogs and as much as we enjoyed ourselves we wouldn’t go back. In September we officially moved out of our parents homes in Maine and into an apartment together in Boston where we both went to college. We adopted a cute kitten and named him Nelson. My mother moved from Maine to Long Island NY to move in with her now husband. The first few months living together were tough but we bought an air conditioner and we got through it. We became best friends with Billy and now he is like family. Thank you Daily Post for reminding me of an important time in my life. Thank you Janet Berridge for the nomination! 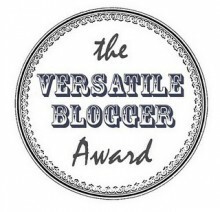 My deepest gratitude for the nomination and encourage my readers to check out her blog SpanishMossSeries. These awards are given by peers to recognize each other for a job well done, keep us motivated to continue writing and in this particular situation share their versatility. We also use these awards as ways to pay-it-forward to other bloggers that we have found to be putting in the time and effort to create great blogs. This is her first attempt at blogging. She falls asleep to Phineas & Ferb every night. Just moved to Florida from Massachusetts, originally from Maine. Engaged to her high school sweetheart (celebrating 10 years in March).